This essay will discuss the use of pastiche and intertextuality in White Noise and Pulp Fiction. “Pastiche” is the “cobbling together” of several original works. It is an imitation of different artistic styles, light-heartedly blended into a new narrative form. “Intertextuality” is the referencing of one text in the interpretation of another. It involves the shaping of a texts’ meaning by contrasting it with other texts. Both techniques examine the relationship between fiction and reality (Ott). This essay will explore how these literary concepts are employed in White Noise and Pulp Fiction, as well as the themes of consumerism, pop culture, media, violence, and death that they inspire in the texts. White Noise has been described as “one of the last real novels of the postmodern movement in America” (Lentricchia). It contains key characteristics of postmodernism, such as paranoia, fear of technology, dark humour and pastiche. The characteristic of pastiche is evident in the shifting tone and style of the novel. It is difficult to place the story into a definitive genre, because it is told in so many differing ways. It moves from social commentary to black comedy, from conspiracy theory to suspense-thriller. It is also a reflection on the dysfunction and isolation of the modern nuclear family (Lentricchia). White Noise combs a number of literary genres into one cohesive work. This schizophrenic narrative arc may be commenting on the affect of technology and media on the lives of people in modern society. Whether for good or ill, DeLillo presents technology as an inescapable force: “You hear it forever. Sound all around. How awful.” (DeLillo). It is annoying and intrusive, but has become so common that characters are not even fully aware of it anymore (Wilcox). This may refer to the title of the book—white noise—the melting of all visual, aural and emotional stimuli into a single, unending, unimportant stream of data. Most of the characters are so bombarded with technology, such as an advertisement for a new car that they are no longer thinking for themselves (Wilcox). Fear of death is the central theme of White Noise, and it is present in both the protagonist Jack Gladney, and his friend Murray. The discussion of death between these two characters one afternoon is described as a “serious looping Socratic walk” (DeLillo). This passage evokes Plato’s Phaedo, in which Socrates and his companions also engage in a lengthy discussion on death. The play presents “death” as an art which must be learnt, rather than something wicked to be evaded or rejected (Al Mousa). Conversely, the character Murray argues that one can come to grips with death “by believing in an afterlife” (DeLillo). But Gladney dismisses this notion as a “convenient fantasy”. This reference is an example of both pastiche and intertextuality, as DeLillo is “recalling [a] less problematic past” by “commenting on the complexity of life in the postmodern era” (Al Musa), as well as creating a dialogue between the novel’s theme of death and an ancient Greek text about the same subject. Pulp Fiction is pure pastiche. The entire film is constructed of dialogue, situations, outfits, hairstyles, weapons and music borrowed from a vast array of different movies, genres and periods. Tarantino pays homage to 1940s film noir, 1970s blaxploitation, westerns, and even kung fu movies. For example, the scene where Marcellus Wallace steps out in front of Butch’s car is a direct recreation of a scene in Alfred Hitchcock’s Psycho, in which the protagonist, who has just stolen thousands of dollars in cash from her workplace, is spotted by her boss. Another example is the scene in which a soldier returning from Vietnam passes on a gold watch to the son of his fallen comrade. It is inspired by the movie The Deer Hunter, in which the same actor, Christopher Walken, plays a POW in the Vietnam War. The scene in which Butch cycles through a series of weapons references a few exploitation films, such as The Texas Chainsaw Massacre and The Yakuza. Floyd Wilson, the boxer Butch was supposed to take a dive on, is the same fighter who Terry Maloy was meant to lose to in On the Waterfront. Even the freeze-frame in the opening diner scene mirrors the ending to Sam Peckinpah’s western, The Wild Bunch (Reinhartz). There are literally dozens of references to classic films, from almost every genre imaginable. Tarantino has crafted a living, breathing patchwork of America cinema. Even the non-linear narrative was inspired by earlier films, such as Citizen Kane, The Killing and Rashomon (Reinhartz). Besides cinema, Pulp Fiction is pastiche of 20th American culture. The film takes its title from the hardboiled detective fiction, such as the Black Mask series. Like the 1940s pulp novels, Pulp Fiction “deal[s] heavily in the realm of improbable coincidences and cruel cosmic jokes” (O’Brien). The two texts also share intricate plot mechanics and an interweaving structure. Tarantino’s “rich dialogue”, dark sense of humour, and use of violence were also influenced by the crime author Elmore Leonard (O’Brien). The movie also hosts many pop cultural allusions, particularly in the 1950s themed restaurant, Jack Rabbit Slims. There is the famous shot of Marilyn Monroe’s skirt flying up over a subway grate; American muscle cars turned into dining booths; a Buddy Holly waiter; and even a swing dance contest. 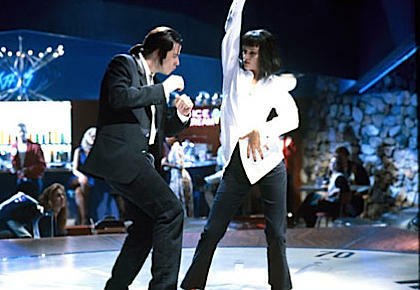 The film exhibits a “playful reverence for the 1950s” and is a “terminally hip postmodern collage” (Walker), or as Vincent Vega describes it, “a wax museum with a pulse”. Some critics have argued that the Pulp Fiction’s constant cultural allusions empty the film of meaning. The violence in the film is without “any critical social consequences” and offerd the audience “only the immediacy of shock, humour, and irony without insight”. The film has been described as being about nothing, “other than its own cleverness” (Giroux). Of course, to empty an artwork of all its contents may just be the ultimate realisation of postmodernism. Instead, the originality of the film can be found in the dialogue sequences. The characters ponder everything from fast food and foot rubs, to TV pilots, gourmet coffee, and divine intervention, all with a wicked sense of humour and sly wit. Pulp Fiction, despite its gangster facade, is far more interested in the moments between the action. For example, we don’t see Butches boxing match; instead we see the taxi ride home. It’s the transitional and trivial that intrigues Tarantino’s lens. Intertextuality informs every aspect of White Noise, from the characters’ comprehension of reality, to the author’s examination of a postmodern society. DeLillo’s characters in are in a conversation with the past. Jack has modelled his whole career around Adolf Hitler, capitalising on his historical prominence to further his own reputation. Murray is devoted to pop culture, and is fascinated by Elvis, who he sees as the embodiment 20th century American history, the same way Hitler embodied Germany. Jack and his wife Babette pour over old family photographs, looking at “children wincing in the sun, women in sun hats, men shading their eyes from the glare as if the past possessed some quality of light we no longer experience” (DeLillo). The entire narrative is a dialogue with older artistic works, from Elvis Presley to Plato (Al Mousa). White Noise has been criticised as being “an irresponsible romp through literary, historical, and artistic archives without any particular point or recognition of the previous work’s contexts” (Al Mousa). But Jack himself argues that “when tradition becomes too flexible, irony enters the voice” (DeLillo). Jack’s ruminations on death exist chiefly within a modernist context. He ponders its significance, visits gravesites, and discusses it with his friend Murray. “Yet Jack’s existential crisis is obsolete in the new postmodern order” (Wilcox). When he confesses “I want to live”, Murray responds with a series of intertextual allusions, from an “aggressive jazz score by Johnny Mandel” to a “Robert Wise film” about a convicted murderer (DeLillo). In this postmodern world, “death loses its personal and existential resonances”. The experience of dying is “utterly mediated by technology and eclipsed by a world of symbols.” (Wilcox). Jack observes during a medical scan that “when death is rendered graphically... televised so to speak... you sense an eerie separation between your condition and yourself” (DeLillo). Murray concludes that death is almost too petrifying to discuss intelligently, arguing that “Ivan Ilyich screamed for three days. That’s about as intelligent as we get” and that “Tolstoy himself struggled to understand” (DeLillo). Murray even ponders whether it is fear itself that brings on death. Murray is referring to a 19th century novella by Leo Tolstoy, called The Death of Ivan Ilyich. In it, a man “tries to cope with his death anxiety by burying himself in work and wholeheartedly embracing the ceremony of his office and position” (Al Mousa). DeLillo is again commenting on Jack’s own fear and denial by comparing him to a literary character from the past. Jack’s capacity to deny or avoid death by viewing it through the prism of television could be seen as a “postmodern version of Tolstoy’s use of illusion... as a tool to avoid death” in The Death of Ivan Ilych (Mousa). Pulp Fiction is so drenched pop cultural and cinematic allusions that it’s somewhat difficult to narrow down a meaningful example of intertextuality. That is, an example in which the film directly converses with an outside text, through which the film itself can be interpreted. The most immediate illustration of intertextuality that shapes the meaning of Pulp Fiction, is Jules’ quoting of the Bible. As Jules explains, before executing someone, he will recite the biblical passage, Ezekial 25:17 (“The path of the righteous man...”;). Jules admits the speech is meant to be more threatening than insightful, and that he “never gave much thought to what it meant”. However, in the final scene of the film, he comes to the realisation that he is “the tyranny of evil men” that Ezekial refers to, and that he needs to become the “shepard” in order to save himself. This transformation represents the film’s fundamental character arc. The “depth of Jules’ transformation is indicated by the difference in his two deliveries of the passage” – the first is majestic and menacing, while the second is calm and reflective (Reinhartz 106). In true postmodern fashion, “Jules reflects on the meaning of his speech and provides several different ways that it might pertain to his current situation” (Conrad 130). It dawns on him “that it refers to an objective framework of value and meaning that is absent from his life” and contrasts with the film’s “prevalent representation of a nihilistic culture” (Conrad 130). The most elaborate intertextual reference in Pulp Fiction is towards the French New Wave film Bande à Part, by Jean-Luc Godard. Vincent and Mia’s dance echoes a very similar scene in Godard’s film, in which a young French girl befriends two bumbling criminals. Mia Thurman’s hairstyle is the same as Anna Karina, who is the protagonist of Bande à Part. Even Pulp Fiction’s production company—A Band Apart—references the text. Unlike the majority of Pulp Fiction’s references, which focus on genre films like western, gangster and war, Bande à Part distinguishes itself as an arthouse film. This indicates a reverence or affection Tarantino holds towards 1950s French cinema, which in many ways, acted as the precursor to the American New Wave of the late 60s and 70s (Walker 320). A final example of intertextuality could be through the character of Vincent Vega. John Travolta portrayed the character, and at the time of Pulp Fiction’s release, the actor had faded out of the limelight that he once commanded with film’s like Saturday Night Fever and Greece. Perhaps Vincent was meant to symbolise the fallen star; a relic from the 70s when disco was king; now reduced to a “wax [figure] with a pulse”. Conversely, Pulp Fiction represented the resurrection of Travolta’s career (Giroux 79). Vincent may also have a textual connection with Tarantino’s previous film, Reservoir Dogs, in which a similar looking character named Vic Vega appears. White Noise and Pulp Fiction each embody the postmodern movement of the late 20th century. By employing concepts of pastiche and intertextuality, they sought to re-examine and redefine literary and film grammar. DeLillo established thematic links between his novel and other works, exploring themes of death in the technological age, and capturing the quality of a media-saturated society. His rich intertextuality and textural contrast provides an important cultural discussion of individuality in the postmodern era. Tarantino took homage one step further, drenching his prose in cultural allusion, and removed all meaning and thematic potency from his work. Tarantino and his characters revel in the cinematic and cultural milieu of postmodern society. He presents a work stripped completely of politics and moral investigation, perhaps symbolising the final surge of the postmodern craft.